German experience in the Spanish Civil War showed that the armor and armament of the Pz.Kpfw.I was insufficient. Therefore, production was ceased in 1938. Nevertheless, the chassis of the Pz.Kpfw.I Ausf.B was used for the purpose of self-propelled artillery. In January of 1940, the first 38 Sig 33 15cm heavy field guns were installed on the chassis. The turret and upper hull superstructure were removed and, instead, an armor box-like shield, opened from above and behind was installed. The Sig 33 gun was mounted on it’s original wheeled carriage. Six companies of these self-propelled guns were engaged in battles in Belgium and France, and later all over the European battle theatre until 1943. In spite of the obviously overloaded chassis and it’s high profile, the Bison I SPG proved to be quite reliable. Some of them remained on the front line in Russia until mid-1943. About 132 SPG’s of this type were produced. Later on, the SIG 33 guns were installed on the Pz.Kpfw. 38(t) chassis. This turned out to be much more suitable for the purpose. Alan was a model company based in St. Peterburg, Russia. It went out of business and sold all it’s molds to a company named ARK, which is in Moscow, Russia. 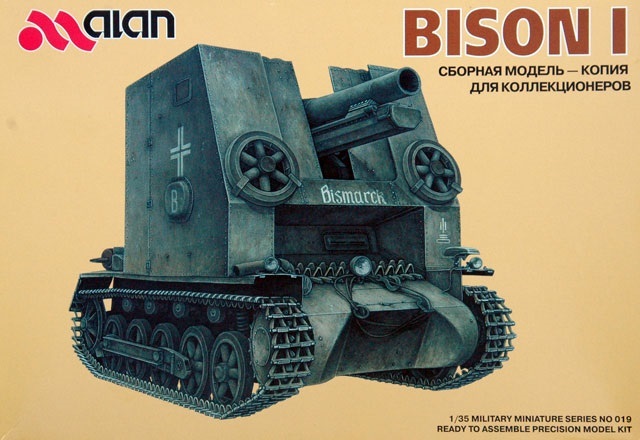 The box art shows a Bison I sporting the individual name “ Bismarck” on the bow and a white German skeletal cross above a white letter “B” on the sides (one of the decal options in the kit). It is in overall Panzer grey. 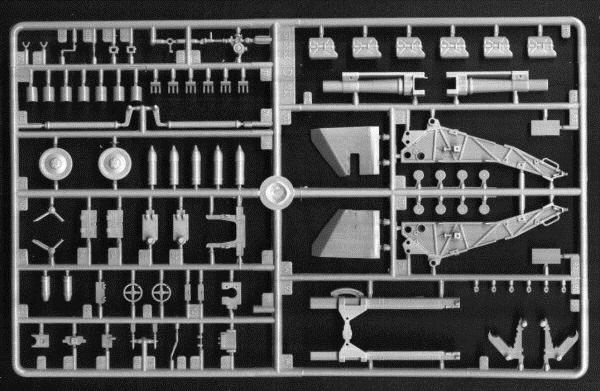 A side panel shows the box arts for 3 other kits that were in the Alan line: a Soviet “Katyusha” rocket firing truck (kit no. 008), a Pz.Kpfw. 38(t) “Gepard” self-propelled anti aircraft tank (kit no. 018) and a Pz.Kpfw. II Ausf.J (kit no. 016). The other side panel has one paragraph histories of the Bison I in Russian, Japanese, French, German and English. Each is marked with a color illustration of the flags of those countries,. This is followed by a color side profile of the box art subject. 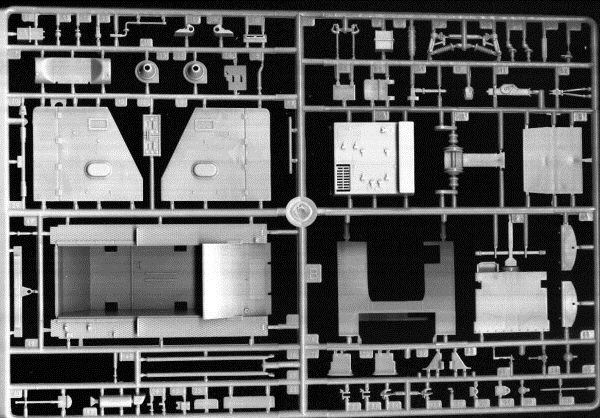 The kit contains one large cello bag that holds 7 medium gray parts trees. There is a small zip-lock cello bag inside this large cello that holds 2 brass PE parts and 2 decal sheets. The unbound instruction booklet completes the kits contents. It holds 6 pages in 8 ¼” x 11 ¾” page format. Page one begins with a black and white repeat of the box art. This is followed by the vehicle’s history in Russian, Japanese, German and English. Pages 2 through 5 give us a total of 18 assembly steps. I looked through these steps and couldn’t help noticing that things were not all that clear about where parts go. Careful study and test fitting are things that will have to be done to avoid mistakes. This is mainly because there are no parts trees illustrations in the instructions. However, the parts trees themselves are alphabetized and numbered. Ammo rounds and their carrying case are shown for placing of their stencil marks on them. The bottom of the page gives the translations for the symbols used in the instructions for paint colors and also a translation of the international assembly symbols too. Below them is Alan’s P.O. address in St. Petersburg when they still existed there years ago. There is no letter A parts tree. There are 4 identical letter C parts trees. These hold the individual track links, the road wheels, drive sprockets, idler wheels, leaf sprung bogies etc. 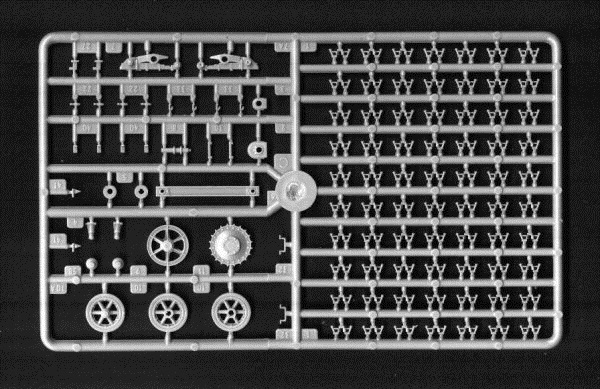 (106 parts per tree) Strangely, assembly of the individual track links is not shown on the instructions. It would have been, at least, nice if Alan had told us how many links per side are needed. Tree letter D holds parts for the SIG 33 howitzer, some ammo rounds, jerry cans, and what appears to be two road wheels that look like they would go on a Pz.Kpfw. 38(t) and not a Pz.Kpfw. I ausf. B. (85 parts) The 6 jerry cans have mounting straps molded on them and separate handles, but they are hollow on the back side and will have to be mounted against a wall plate. They also do not have any pour spouts. These can probably be fabricated from some discs punched out of sheet stock. 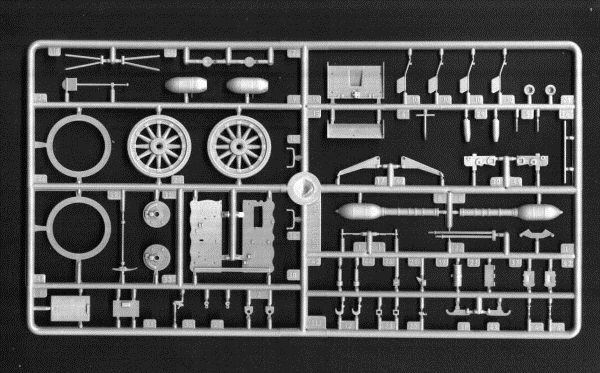 Final items in the kit are the 2 decal sheets and 2 brass PE parts. One decal sheet is for the SIG 33. It gives stenciling for the ammo rounds and a information chart that goes inside the gun shield for the gun crew’s use. The other decal sheet is for the vehicle. It includes the German crosses, a decal for the dash board instruments, vehicle alphabetic letter designations,. division and tactical markings. One of the PE parts is the perforated muffler shield, which will have to be curved before installation over the muffler. The second PE part is some slats that are to be sandwiched inside of the air intakes to the engine compartment. There are no crew figures provided in the kit nor clear parts. I think that this kit will make up very nicely and the detail is very good in it. I put together the SIG 33 gun, by itself, that DML sells separately several years ago. It was a joy to build and has won a few IPMS awards for me. I bought this kit back in 2003 at my local hobby shop. ARK sells the same mold as their kit no. AK 35005 and even uses the identical box art of the old Alan kit.